When we heard that the oldest house in Saratoga Springs was for sale, we had to check it out. It looks very much like... a yellow house. In fact, if you didn't know this was the oldest house in Saratoga (built in 1815), you'd probably never realize it as you walk down Franklin Street. Didn't The Figgs used to live / rehearse there? If CCR is correct I'd say that triples the house's value. 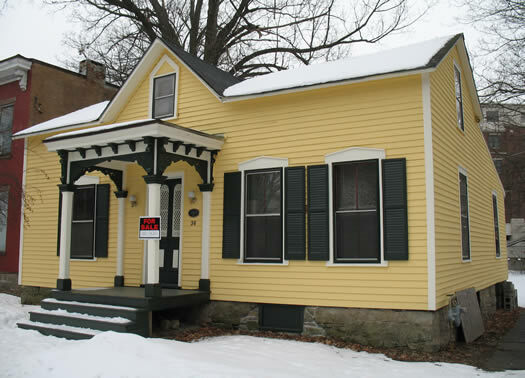 The house on the corner of Clinton and Van Dam is the oldest building in Saratoga Springs according to Sylvester's History of Saratoga Springs (published 1878). Built by William Waterbury who moved his family into that building on 04 Apr 1808. Prior to that, it was a boarding house for visitors to the springs. Roger Birchard, the grandfather of the future president Rutherford Birchard Hayes, came here from VT hoping the water of the springs would cure him but he died in that building on 22 Aug 1805 and was buried in Sadler (or First Cemetery) on Nelson Ave. All of these facts are documented in several records in Saratoga. In many articles in the early newspapers about the Waterbury family this has been mentioned.